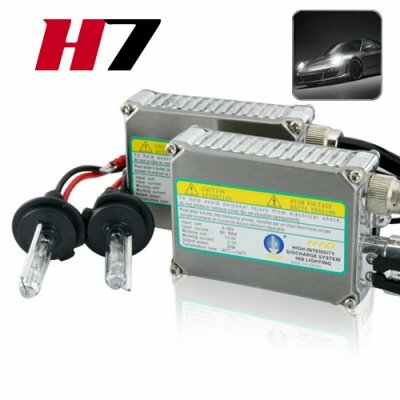 Successfully Added HID Xenon Headlight Kit (H7) - 6000K to your Shopping Cart. Improve your vision at night by 300%! If you don’t have HID Xenon lights installed in your car, truck, van, or SUV, then now is the time to upgrade. The installation is easy for anyone to complete in 60 minutes or less and we guarantee that once you experience the increased clarity which these HID Xenon bulbs provide, you will never use another halogen bulb again! What surprises most people about HID Xenon bulbs is that despite producing 300% more light, they consume approximately half the energy which halogen bulbs use. The best part is that even with 3x the brightness, they still last between 2000-3000 hours compared to 450 and 1000 hours for halogen lamps. And since this kit is built using the same manufacturing process as brands such as Hella, Phillips, MTEC, and Bosch, you can feel confident knowing that this kit will outlive the life of your vehicle! Visual clarity at night is only 5% of what it is during the day. As a result, the risk of an accident greatly increases. The situation is worse when driving in bad weather, especially in fog or storm conditions. However, you can greatly improve your clarity in these conditions by upgrading to a pair of these HID light bulbs. This Xenon kit uses 6000K HID lamps which create light that is very similar to natural daylight. Because of this you will not blind oncoming drivers, but you'll still be able to clearly view objects from a far away distance, easily read road signs, and navigate safely at night. These HID Xenon bulbs produce 2,800 to 3,500 lumens of brightness versus traditional halogen bulbs which only produce between 700 to 2,100 lumens. The real world benefits of these numbers-- you are able to see an extra 30-60 meters or up to 15 car lengths farther to avoid dangers. Your peripheral vision is almost doubled to account for pedestrians and animals that might suddenly dart onto the road. The bottom line-- you dramatically improve your safety when driving at night. With Chinavasion's market share in wholesale electronics, we're able to bring you factory prices on these high quality HID Xenon headlamp kits. Look on eBay and you will notice how identical kits sell for more than double the price of this one. If you are in the resale market then this is a good chance to make some great income without a lot of effort. The best part is that unlike our competitors, our CVEN-A32 HID Xenon kit actually comes with a 12 month guarantee! Order in bulk now while supplies last and we will express ship your package by tomorrow. Conversion kit includes HID Xenon bulbs and the lamp ballasts required to operate them. Why can I not just replace the halogen bulb in my vehicle with Xenon HID lamps without having to purchase the entire kit? Motorcycles and automobiles currently use a 12 Volt electrical system for their headlamps. True Xenon HID lighting systems require over 20,000 volts to ignite the bulbs. Once lit, they only require 12 volts to keep running. This kit includes the power pack that is necessary for the lamps to turn on. Could I re-install the original halogen bulbs after the Xenon HID kit has been installed? Could I Install the kit myself? For anyone who is mechanically inclined, this installation is considered "do-it-yourself". While a typical installation takes approximately an hour, it can vary depending on application. If you are uncomfortable installing them yourself you can hire a professional to do it for about $30-$50 depending on the mechanic.